Feed with a small plastic syringe. Put one teaspoon of "Exact" into a small jar (you can use a baby food jar), add baby food beef to the formula. All baby birds eat bugs, so you are making a worm. Stir it up - if the bird is very young (transparent) then add a drop more water. Add a teaspoon of baby food applesauce. This is a complete food for the baby bird. 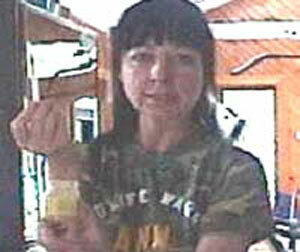 If you do not have Exact, then mix a raw egg yolk with the baby food beef. Crack the egg over a sink and let the white run out. Then stir the yolk into the baby food. Be sure that it isn't runny, but you should be able to draw it into the dropper and release it easily. 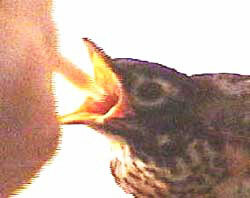 This baby Robin (above) is "gaping:" and wants to be fed. He will push up into the syringe and you can push the plunger very slowly (below). Allow the food to be swallowed before injecting more. 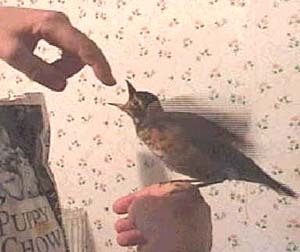 If the bird is older and has all his feathers, as in the photo above, you can feed moistened dog food. 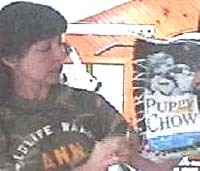 Soak puppy chow in hot water and, when it's soft and warm, pop it into the gaping mouth. Slightly crushed blueberries are another treat. Note: If you see a baby robin fluttering and hopping along the ground, he may be just fine. Robin parents feed the fledging robins on the ground for a couple of days while they are learning to fly. Look for parents; they are almost always nearby.